In this pic is a staircase where nothing is out of the ordinary. 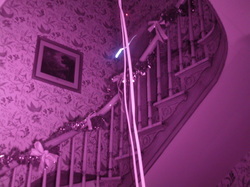 Note you can clearly see the wallpaper between the spindles of the staircase. 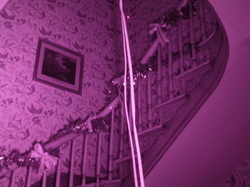 The two lines in the middle are camera cables from the second floor, also the red light on the wall is supposed to be there. Now in this one. The wallpaper is blurred and a light anomaly coming down the stairs. Nothing is wrong with the camera,the pics were taken one after the other in about 2 seconds. Can you try to explain this? Please leave a comment if you can? If you can't comment also or ask question's for a new blog topic. Thank You.